Famed developers Capcom have unveiled a new Mega Man 11 trailer at Tokyo Game Show 2018 featuring the chilliest Robot Master, Tundra Man. The cold-hearted boss features first in the brand new clip, previewing other Masters like Acid Man, Rubber Man, and more. The colourful 3D art style and fast, side-scrolling gameplay accompany the dastardly boss line-up. Tundra Man’s figure skater outfit isn’t because of his Yuri on Ice obsession. The Master ‘with a penchant for ice skating and a flair for the theatric‘ was once a surveying robot keeping track of freezing environmental anomalies. Tundra Man built a passion for ice skating and performance through watching television championships during his isolation in the coldest corners of the globe. His newly claimed frozen museum lair sets the scene for Mega Man’s assault on his domineering tendencies. Mega Man’s coldest rival finds power in ice storms and blizzards, providing the hero with Tundra Storm on defeat. The deadly icy spin allows the player to prance across the stage, defeating foes above and below with style. Mega Man is an iconic series first releasing on the Nintendo Entertainment System in 1987. The Capcom classic has a loyal fanbase that follows the property and creators throughout their successors. Original designer Naoya Tomita released inspired Mighty No. 9 in 2016 to unfortunately average and poor reception. After the incredible excitement and a successful Kickstarter campaign for the project, the die-hard fans of the series and its nostalgic gameplay weren’t impressed. Since then, the upcoming Mega Man 11 has been in the works with Resident Evil and Capcom veteran, Koji Oda, attached. Hopefully, the players find 11 satisfying as the investment is clearly quite strong from the community. The latest edition in the definitive series blends masterwork, challenging 2D platforming with a crisp new look. The charming visual style reinvigorates the iconic 8-bit colourfulness, ‘combining hand-drawn environments with detailed, 3D characters‘. The Blue Bomber needs to battle Robot Masters and take their powerful weapons for himself to save his universe. Obtaining these special trophies now transforms the Mega Man’s appearance with interesting features. A brand new ‘Double Gear‘ system lets the hero boost speed and power for a twist on the nostalgic gameplay the series is so well-known for. For those veterans looking for a real challenge, a variety of difficulty modes will allow fans to fine-tune their experience. Speaking of modes, Mega Man 11 includes a range of supplementary activities including Time Trial, Missions, galleries of concept art, leaderboards, and more! Now just days away, Mega Man 11 will arrive on PlayStation 4, Xbox One, Nintendo Switch, and PC on 2 October. 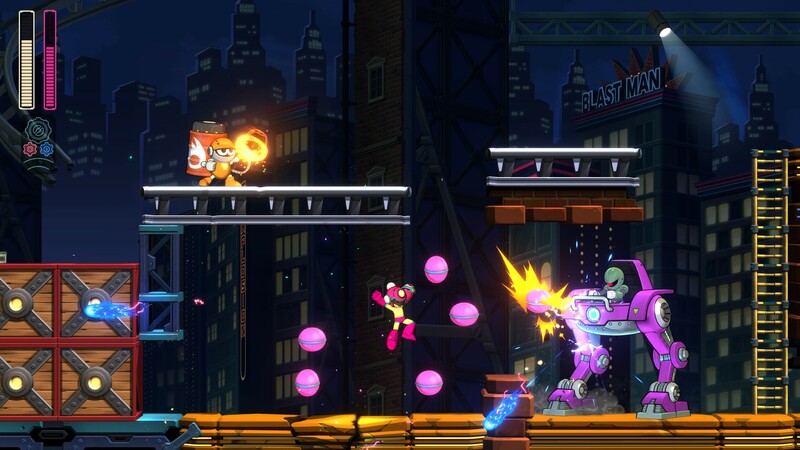 Check out the Mega Man 11 Demo and participate in the #BustBlockMan Challenge now if waiting isn’t your thing.